While the time change sure made it hard to get up this morning, it was a gorgeous, sunny day. This means you can really appreciate the time change in the evening. Yesterday it was dark and rainy so you really didn't get the full effect. I went with legs. I figured I'd been putting off my leg workout long enough. I really wasn't super excited about it, but once I got going, it was all good. I did increase weights for 3 exercises as well. After a 20-minute warmup on the elliptical, I went with supersets of 3x8 unless noted. I was happy with how I felt with the workout. And even happier to walk outside to sunshine and warm temps, as in 78 degrees. Ahhhh, perfect temperature if you ask me. Since Jason discovered his lactose intolerance, we stopped cooking with much cheese. But every once in a while, he really wants something we used to make - like goat cheese quesadillas for example. Being that it's Mexican Monday, I figured I'd make the man happy. I mean, he did put up with me for a 6.5 mile run on Saturday after all. In a large non-stick skillet, saute the onion in small amount of olive oil and dash of salt on low heat for approximately 15 minutes to start to caramelize. Add in garlic, beans, bell peppers, sundried tomatoes, and spices. 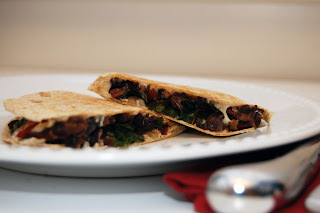 Lightly mash the black beans (this helps ensure they don't roll out of your quesadilla later on). Allow to cook approximately 8-10 minutes then add in the spinach and cook until that begins to wilt. Re-season if needed. If mixture begins to become too dry, you can add in a splash of white wine or vegetable broth. Remove mixture from heat and transfer to a bowl. Wipe out your skillet and return to heat. 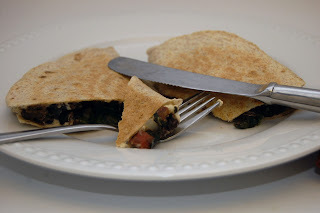 Very light brown one side of the tortilla, flip then sprinkle with small amount of shredded cheese, crumbled goat cheese then spread the bean and spinach mixture on half the tortilla and fold the other half over. Cook until the bottom is browned them flip and brown the other side. Repeat until mixture is gone. Top with your choice of toppings such as Greek yogurt, sour cream, cashew cream, even jalapenos. The filling is very subtle in terms of flavors. The punch really comes from the sundried tomatoes and the goat cheese. If you wanted to make this vegan, I think it'd be important to add in lemon juice and maybe kalamata olives for the additional "tang." I had to giggle to myself while I was making this. I have never truly succeeded at caramelizing onions. I've tried, they get super soft, but that's it. One year my sister had family over for some event and had decided to caramelize onions. She had the heat on super low, they were cooking super slow. But never really cooking. I kept stirring them for her only to discover about 30 minutes later that the flame had gone out. So of course when I started mine today, I kept checking the flame. Don't forget to enter my giveaway for Food Should Taste Good if you haven't already. Winner will be announced Friday, March 16.